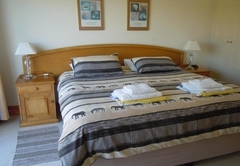 False Bay Lodge is a highly recommended property providing self catering in Simons Town for up to 4 guests visiting the False Bay region. 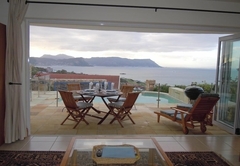 False Bay Lodge, Simons Town, is a luxurious and spacious modern apartment overlooking False Bay with its clean, unspoilt beaches and magnificent mountains. There are panoramic sea views from all rooms in the apartment. 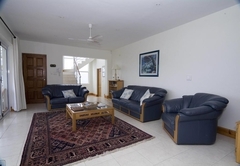 The holiday apartment ith its own entrance, has an open-plan, north-facing, living area on the ground floor with expansive glass folding doors which open onto a heated swimming pool and sandstone tiled patio. 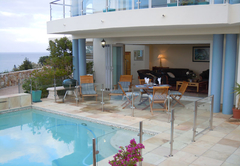 The pool (child-proofed with glass and stainless-steel balustrade) and patio are exclusively used by our guests. 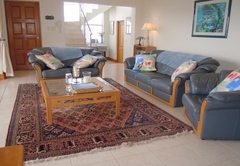 The lounge is furnished with full-grain leather lounge suite, oak cabinets, flat screen TV with DStv, DVD and free ADSL computer connection; the patio is equipped with Indonesian teak pool loungers, table and chairs. 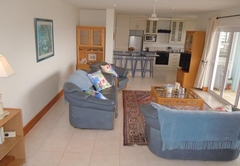 The fully equipped kitchen has granite counter-tops, ‘fridge / freezer, dishwasher, oven and hob and microwave oven. 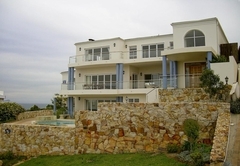 A staircase, with dramatic picture window, showing the easterly view across False Bay to the distant Kogelberg Mountain Range, leads to a landing with ‘library bookcase’, from which there are two en-suite bedrooms, one with twin beds, the other with king size bed with pocket springs. 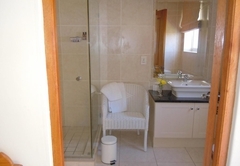 The bathrooms are modern in design; one has a bath and the other a frame less glass shower. 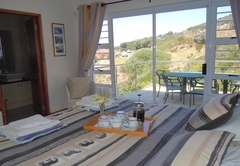 Each bedroom has a sliding door opening onto a balcony where you can enjoy your early morning coffee watching the sunrise over False Bay, or at night the moonrise across the water. The unit is tiled throughout with large, light-coloured ceramic tiles; a huge, thick-pile, hand-knotted Persian rug in the living area and bedside rugs in the bedrooms add a softening feature. There is dedicated garage parking with direct access from the garage into the apartment. Under-floor heating is provided in the bedrooms and living room for those chillier winter evenings and a ceiling fan to keep you cool in the summer months. 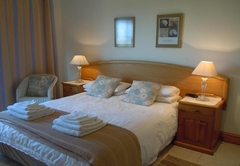 Bed-linen, fluffy white towels, swimming towels, hairdryers and complimentary toiletries are provided. A washing machine for your sole use is situated in a utility room accessed from the garage. Children’s equipment such as cot, high chair and stroller are available. Smoking is permitted on the patio only. The unit is rented out to one party at a time, even if only one bedroom is required. 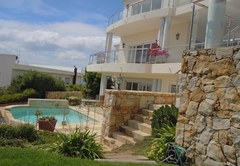 A safe swimming beach is within walking distance and it is a short 2km drive into Simons Town with its interesting harbour, museums and waterfront restaurants. Boulders Beach, home to a colony of African penguins, Cape Point Nature Reserve, Chapmans Peak Drive and Kalk Bay (popular fishing village known for its antique shops and restaurants) are also nearby. Constantia Valley Wine Route and Cape Point Vineyards are readily accessible. 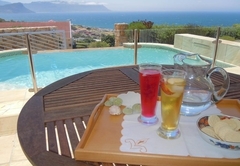 For the more active there are whale and great white shark tours, scuba diving, and kayaking all operating from Simons Town; surfing lessons at Muizenberg beach; enjoy a game of golf at Clovelly Golf Club (10km), Westlake (15 km) or Simons Town (1km); ride a horse along Noordhoek beach (10km); take a walk in the mountains (this is hiking paradise!) or Cape Point Nature Reserve (10km); snorkel or swim with the penguins at Boulders Beach; mountain bike or road cycle- the world famous Argus Cycle Tour goes through Simons Town. Your hosts Angela and Peter live on the property and will gladly advise you. There is something for everyone! We will gladly help you plan your excursions and assist with bookings if necessary. There are panoramic sea views from all rooms in the apartment. 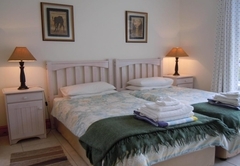 It has 2 en-suite bedrooms, one with twin beds, one with a queen bed. The living room has glass folding doors which open onto the heated swimming pool and deck. 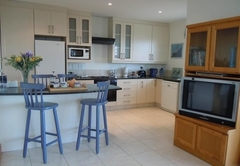 The open plan kitchen has granite surfaces and is fully equipped including dish washer, stove and microwave oven. Best holiday we have ever had! The hospitality was up there with the best. We will definitely be back and will tell all our friends about this spot.